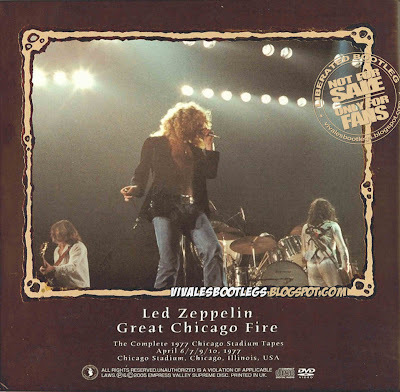 Recorded Live at Chicago Stadium, Chicago, Illinois, USA - April 06 - 10, 1977. Very good Audience Recordings :: Silver CDs :: Lossless FLAC. Files: 62.:: Size: 3.09 GB (flac). This is probably the only show in the Led Zeppelin collection that is better known for a visual than the music. Led Zeppelin, the band, were always proud that no matter how outrageous their behavior, the attention, or anything else, the music was always center stage. Not tonight. This show is most famous, and mostly discussed, as "the night Jimmy Page wore the Stormtrooper costume." And that's a shame. This is a really great show. Led Zeppelin had been to Chicago before, and had never really turned in a great performance there for several reasons, including Plant's case of the flu (1970?) and Jimmy's broken finger (1973?) 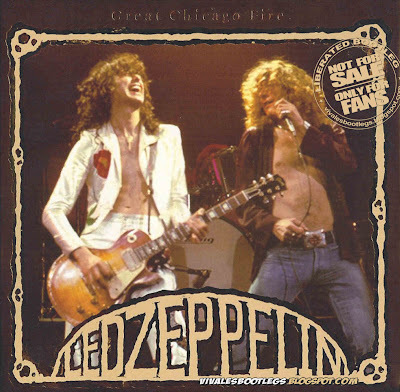 - Led Zeppelin felt they owed Chicago one, even though Jimmy wasn't feeling well on this night either, whether from sickness or stoned-ness. And Chicago got a whale of a show. The setlist is tremendous, and the performance inspired, with classics like Ten Years Gone and Achilles Last Stand dominating the very long set. This set is recommended to the die-hard Zeppelin collectors only. The average collector would consider this a bit of a rough ride. Until new sources or soundboards surface from these nights, this will probably be the definitive and maybe only updated release of these shows. Considering the source tapes; a nice job and an excellent presentation..<- Info taken from collectors music reviews dot com>.